This novel is slightly unusual in that it is a novelization of an audio dramatization. It was serialized as a free audio book by the author in 41 installments from April 5 to October 31 (starting prior to and ending after this book's publication). Pigs are looked down upon in this world of anthropomorphized animal (including human) nations and magic, of dramatic geographic names like the Burning Lands and Island of the Dead Warlords. Cecil “Eberhard” Berringer, a dwarf boar from the Faunatian Confederacy with a dark ring around his left eye, and his friends Corbin Zellig, Johan Tyson, Gustave Baldur, and Byron Warner, have formed Piggy Moto, an all-boar tuxedo-dressed instrumental and vocal music group, to help boars to gain a better public image. They rely upon their musical talent rather than upon flashy magical stagecraft to impress their audiences, and do well enough that they are invited to perform in an international music competition, in the distant city of Farpoint in Lancemyth. The contestants are put up at an opulent hotel, the Sheltering Arms Inn. Yet the Northern port city of Farpoint is chilly and bleak, and the boars are not happy there. Some of their competitors seem friendly, while others openly regard them as rivals to be beaten. Worse, it seems that all of the contestants have received anonymous threats, fulfilled by the theft or sabotage of their musical instruments – which indicates that their attacker is among them or has access to the Sheltering Arms. The violence escalates. Byron is attacked and abandoned in Farpoint’s snow-covered streets. The beer in the Sheltering Arms is poisoned; many contestants fall ill and Eberhard almost dies. The threat of death is clearly meant to unnerve all the contestants. Finally there is a murder. All remaining contestants are suspects, including Piggy Moto. The stress leads to dissention among the boars, and Piggy Moto seems in danger of breaking up. Piggy Moto has a lot going for it. 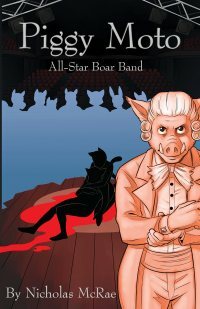 The mystery is a solid whodunit that keeps the reader guessing up to the end, with an imaginative choice in its pig band protagonists. The setting is a colorful world, full of richly varied lands and animal peoples from the Arablike Adabbans (Hassan the camel, Houssam the jackal, Sami the hamster, and Abdul-Ra’d the stallion) to the Japanese three mink sisters. There is a vast variety of mammal types and a few birds and reptiles: dogs, rabbits, foxes, a bat, a bear, a porcupine, a meerkat, a bobcat, a hedgehog, a beaver, a ferret, a lizard, a wren; including some fantastic creatures such as water and air sprites, gremlins, and, offstage, unicorns. But these animal peoples all feel like humans in animal costumes. All, from camels to mice, are conveniently the same size, with few descriptions of unique animal characteristics. This makes them unconvincing despite their colorfullness. The main flaw is the writing, which never achieves a verisimilitude. Its worst aspect is in trying to rise above mediocrity by using colorful descriptives rather than the usual simple ones, and giving the characters exaggerated accents to make them distinct from each other. Before the pigs could come to blows, a small bell hanging next to the front entrance began to tinkle and chime. ‘Oh, right, right,’ said Gustave, picking up on the horse’s cue. ‘Thanks for the lead, mate.’ He passed a coin to the stallion. ‘It was my pleasure, sirs,’ said Geoffrey, tipping his hat. With that, the horse took his leave. ‘When you are ready, sirs,’ said the girl, ‘Matthew will take you to your suite.’ She handed the key to a small, feline lad who’d skulked in unnoticed. A queer sense of foreboding descended upon the swine; was it already too late to reverse their course and sail home? So is Piggy Moto worth reading? On the whole, yes. It may not be lasting literature, but it presents a good plot in a vivid setting, with genuine surprises at the climax, and an attractive cover by Analon. The overly artificial writing can be tolerated for the length of the story. You could do worse than invest an evening or two’s time in getting through this novel. Hey there! Thanks a ton for the indepth and honest review. It's great to hear what you liked and disliked about Piggy Moto. You've given me a lot to watch out for as I work on my next manuscript.